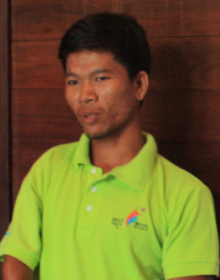 Seng Sophat is from Kampong Cham Province is a graduate in Rural Development from Chea Sim Kamchay Mea University. Sophat volunteered with Youth Star to serve in in Kourk Ngoun Village, Tropaing Russey Commune, Kampong Svay District, Kampong Thom Province. Living in a host family made up of grandmother, grandfather and grandson what interested Sophat most, when he first arrived in the village, were the children and youth. Sophat noticed that the youth in the village were not getting along well. They were lacking in self-confidence and had little or no sense of responsibility or spirit of team work. Undaunted Sophat noticed this situation and it strengthened his commitment to bring them together so that they could be a great resource for their community. Sophat also noted that the youth became more knowledgeable as they learnt to both be engaged with and contribute to community projects including repairing access roads, cleaning the schools and pagodas. Club members also learnt directly how to teach younger or weaker students with subjects such as mathematics, Khmer and English. Sophat firmly believes that the responsibility of the youth has built to the point that upon the completion of his service, he sincerely believes that the club will continue to serve the community and young children. For this sustainability it has proven important that the club be formally registered and recognized by the commune.